Greg Jennings, what is it, exactly, that you want from Aaron Rodgers? Do you want a buddy? Do you want him to personally apologize for every bad throw? Do you just want him to return your text messages? What is it that you want? I only ask because you can’t stop talking about him. Literally one day after you make an announcement about your retirement, you’re on Colin Cowherd’s show talking about… Aaron Rodgers. But why? Was your high profile dustup with the best quarterback you’ve ever played with (including Brett Favre) such a big part of your career that you had to talk about it in an interview that’s ostensibly about the high points of your playing days? Moreover, did you book an interview with notorious crap-stirrer Colin Cowherd and somehow think he wouldn’t ask you about it? For those who may not recall what that one sided exchange of words was about, let’s refresh our memories as to what Mr. Jennings had to say just three years ago, upon leaving the Packers for Minnesota. Speaking to the Minneapolis Star-Tribune, Jennings had quite a bit on his mind about Aaron Rodgers, even if he wouldn’t address him by name. “For me, I’m such a team person, I’m going to defer to my teammates. I’m going to defer to the team, to the team, to the team. And I think when you reach a point where you’re not deferring to the team any longer, it’s no longer about the team. And now, as time has done its thing and healed all wounds, you again have things to say about Rodgers, telling Cowherd you want to let bygones be bygones… or something. “Those were my feelings, and quite honestly a lot of that came out of spite of wanting to stay in Green Bay and not having that opportunity, and feeling like, you know, someone like him could have stepped up and said something. You can really feel the waves of forgiveness rolling off of him. Look, clearly there is something to this cold, one-sided feud. Even the ever-vivacious Donald Driver wasn’t always effusive in his praise of Rodgers after leaving Green Bay. There may be something to the slowly bubbling complaints about Rodgers. Greg Jennings' contributions in the 2010 playoffs helped Green Bay win a Super Bowl. What happened between him and Aaron Rodgers? But on the other hand, what do you want, Mr. Jennings? What should each of us want? Do we all demand that our coworkers be our best friends? Do we insist that the person who drives the bus of our collective success share the spotlight? Do we have the right to make people treat us the way that we think they should treat us, and then complain loudly and publicly when they don’t? We know that quarterbacks are going to get the most attention. We know that no matter who else contributes, they will get the most credit. And as you astutely pointed out, we also know that all of us have flaws. Does it matter if Aaron Rodgers is not nice? Think about the last time you heard a parent tell their child to play nice. Were they really trying to get them to be a good person? Or were they just trying to get them to fall in line until they could get home and give them a scolding? You want Rodgers to be nice, I get it. But after two MVPs, a Super Bowl championship, and other accolades too numerous to efficiently communicate, does it matter if he’s anybody’s pal? Like we’ve said, everyone has flaws. Literally every starting NFL quarterback has done something less than glamorous in their careers that has drawn attention away from their teammates and the team overall. Blake Bortles made people write bad headlines. Sam Bradford doesn’t realize he’s not really in a position battle. Tom Brady screams at low-level assistant coaches because he’s so classy. Drew Brees endorses things he’s contractually forbidden from using. Teddy Bridgewater said mean things about Cleveland. Derek Carr makes bad jokes. Kirk Cousins used his wedding to poke fun at someone. Jay Cutler married an anti-vaxxer. Andy Dalton took offense at probably the least offensive trash talk ever. Ryan Fitzpatrick screws up his team’s quarterback situation due to his own financial demands. 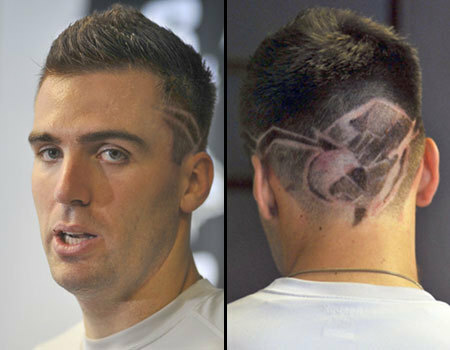 Joe Flacco willingly let someone do this to his hair. Blaine Gabbert is literally one of the worst quarterbacks of the modern era. Robert Griffin III was weird and cryptic about his exit from Washington. Jared Goff had a really awkward interaction with Yasiel Puig. Andrew Luck grew a gross neck beard. Marcus Mariota takes time away from offseason training to film commercials. Cam Newton didn’t jump on that fumble. Brock Osweiler said a whole bunch of untrue things in his introductory press conference. Carson Palmer walked out on the Bengals. Ben Roethlisberger… has done almost literally too many things to count. Philip Rivers always complains about everything. Tony Romo played way too much golf. Matt Ryan made you prove you were rich before you could see his condo. Mark Sanchez continues to be Mark Sanchez. Alex Smith is really boring. Matthew Stafford won’t give up his bad habits. Ryan Tannehill let his wife leave a gun laying around. Tyrod Taylor bought himself a $3000 mouthguard for his first start with the Bills. Russell Wilson lied about his brain healing concussion water. Jameis Winston found himself in a whole bunch of dumb situations. The point is, if you look hard enough, everybody has something that makes them unpleasant to be around. For Rodgers, it could be a big thing that nobody knows about. For the others, as we’ve seen, it could be any number of things. But all of their teammates have to deal with them, just like everyone has to deal with their coworkers. Maybe, just maybe, it’s time to move on and let it go.